Taking off my wellies and hugging Marco goodbye. Off to Madrid to see Sarah, eat tapas and celebrate my birthday. Have a great time, Wendy. And Happy Birthday! Hope you have a good time. Try not to miss Marco too too much. ah yes tapas. im an expert in eating those! you should go to granada in the south sometime. there they are free! Have a wonderful birthday! Enjoy all the delicious Spanish food. have a great birthday – love your wellies! Have a great holiday Wendy and Happy Birthday for when it comes! Have a great birthday and holiday – looking forward to hearing about it when you come back. Trying not to feel too jealous. Failing. Kind (if green-eyed) regards from Ireland….. Sounds like huge fun – have a great time and a fab birthday! Bet you’ll miss Marco, though… and he you! Adios and Feliz Cumpleanos. Have a brilliant time. Happy Birthday Wendy ! Have a marvelous time! Looking forward to your fantastic photos! Have a fabulous time, Wendy! LOVE your wellies! And a tiny bit of Scotland to hang on to – I’m so glad I’ve discovered your blog. 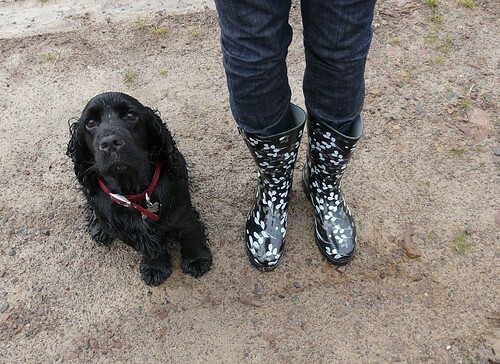 Cooking, Scotland, Wellies and a handsome dog – just wonderful! Hope you had a wonderful trip and a VERY happy birthday. I will check in on you when I return. Of to the UK for a week! So excited! Those are VERY fine wellies indeed!